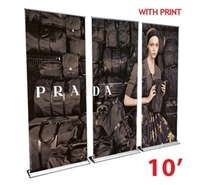 Our ultra-portable banner stands are completely retractable. Convenient roll-up or telescoping styles enable you to take them anywhere. Order them with a laminated vinyl banner to complete your stand. 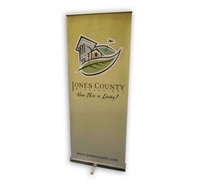 Banner stands are an inexpensive solution to advertise your business anywhere. 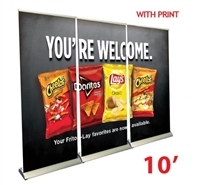 Use them to compliment your trade show booths and store fronts. Our full color graphics experts can help you create a professional, high-end impact while keeping costs down. 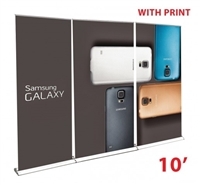 Our retractable banner stands can enhance your trade show booth needs by creating a cost-effective but professional, high-end impact. 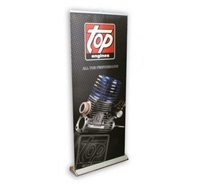 It is important that your retractable banner stands create a visual impact to be successful. Let our experts create a eye catching graphic for you, that will draw the attention of visitors instantly. Here are some of its advantages. 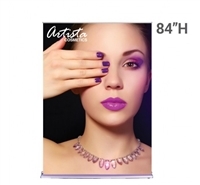 Flexible use: For better visual effects, they can be combined with other displays. 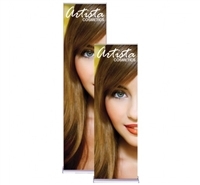 Being attractive and reusable, they are the most preferred choice for displaying all forms of promotional messages. 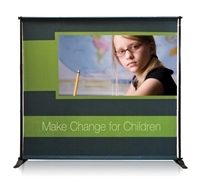 Durability: Our banner Stands are made from a special kind of material does not get worn out and wrinkled easily. As our customers can attest, they remains durable and lustrous even after continuous use. 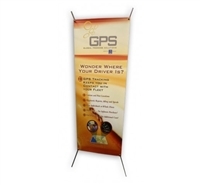 Easy shipping: As compared to other banner stand pop up displays, shipping our ultra-portable banner stands is inexpensive and easy. Easy set up: Our stands set up in seconds, and they do not need any external structures for support. They adapt to any space without any problem. 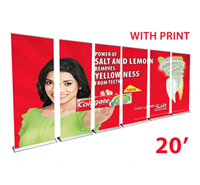 Other Uses: These displays can be used for variety of other purposes long after its use at the trade shows is over. 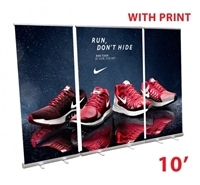 Businesses can place these stands at other locations like outside exhibition halls, event venues, show rooms and retail areas for advertising their company products. 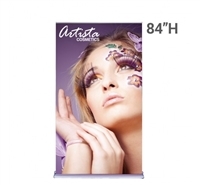 One caveat: Banner stands have limited ability to exhibit products and literature, therefore trade show booths that want to display their products must either opt for other tools or must combine it with mural banner stands such as our SBBRG3377. 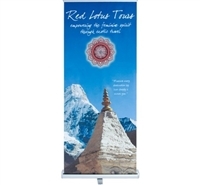 EXHIBITOR ADJUSTABLE BANNER STAND, 30" X 48"
EXHIBITOR ADJUSTABLE BANNER STAND, 48" X 120"